All things considered, this has been a pretty good week! My ankle is doing a lot better! The swelling is gone and the bruising is finally starting to fade, so I was finally able to wear cute shoes again this week! 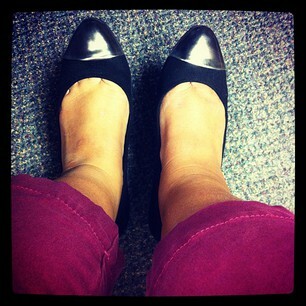 I have been dying to rock these cap toed flats since I got them before my tragic ankle injury. Let me just say, I love walking! And looking cute. And not having my foot look like Honey Boo Boo’s mama’s forklift foot. Thanks to the lovely Rebecca (and the awesome tutorial at Hello Giggles) for inspiring me to learn the art of the sock bun! 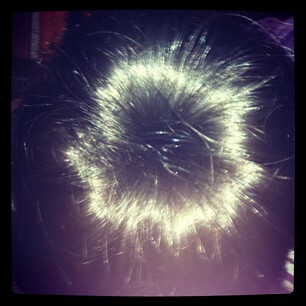 I am officially obsessed with sock bun-ing and I’m gradually getting better at it, so A+ for Alyssa. I’ve been admiring sock buns on blogs and in real life but never thought that I could do it (well, until I sprained my ankle and couldn’t really do anything else but mess around with my hair). To those of you who are beauty impaired like me…you can do it! I also found one of the lids to my classy ’95 Holy Cross mug (of which I have three or four…I lost count). I can feel myself starting to get sick, so I drank up on warm beverages to soothe my itchy throat. 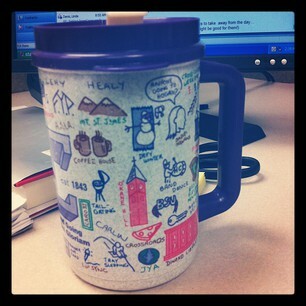 I brought the mug to work and I think my coworkers are super jealous. Actually, I don’t think anyone has seen it yet. Whatever, haters gonna hate. Speaking of work, I’m really starting to hit my groove! I did two site visits this week, visiting VISTAs at two of the elementary schools in New Haven. Our project staff has also been coordinating a statewide training with the state office and another project, so things have been pretty busy, but I am really loving it!